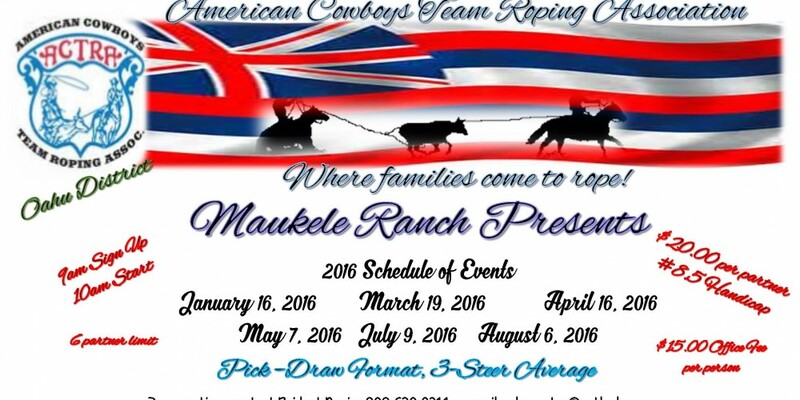 Don’t miss the first Oahu District ACTRA Team Roping of 2016. This is a #8.5 Handicap. 3 Steers. Sign-ups at 9 a.m. Roping starts at 10. $20/partner and will be a pick/draw format. For each pick you’ll get a draw, 6 partner limit. Office fee is $15/contestant. For more info, contact Bridget Napier at 808-630-9211.